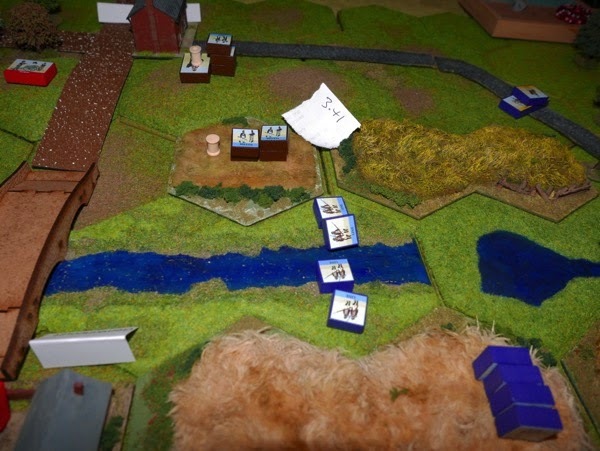 This post covers the first few play tests of a new set of rules that I am working on with a view to getting some napoleonic games onto a hex grid within a relatively small gaming area. 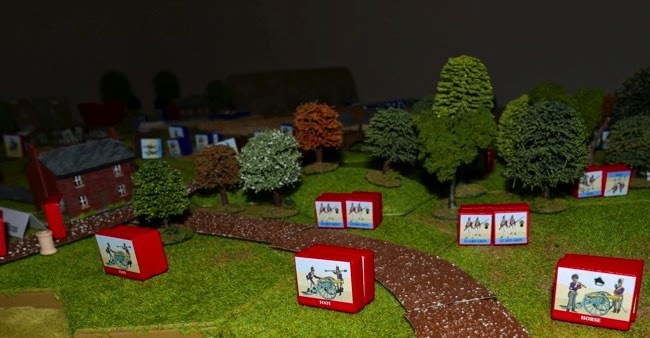 There are examples of both boardgame and figure game battle boards. The units represent brigades and divisional artillery and the rules are set at the lower end of the complexity spectrum. Play is solitaire friendly and fits into an evening game session. To read the rest of this post, please tap on the 'Read More' tab. I have been wanting to do this for a while and the 200th anniversary of the Waterloo campaign battles in mid June has given me the motivation to just get on with it. I am intent on using the rules with a Kallistra hex battlefield (4" hexes) and Pendraken 10mm figures. This is very much a work in progress and at this moment in time, I do not even have figures for the Waterloo campaign. Having originally planned to do the 1809 Danube campaign first, I have French and Austrian 10mm figures (Pendraken) in the painting queue. Anyway, this doesn't matter so much because it struck me that I can use GMT's Commands and Colors game parts to play the game and test the rules. 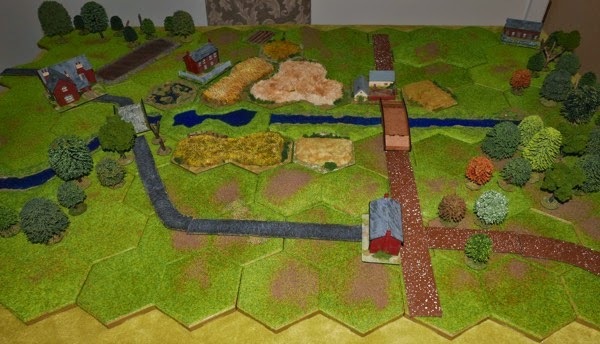 The plan is that by mid June, I will have posted a more refined version of the rules together with a Quatre Bras scenario based on a 12 wide by 9 deep hex grid (on a 4' x 3' table when using 4" hexes), though it will of course also work fine on a GMT C and C board with blocks. Link to GMT shown in resource section. The first play test one was done solitaire. 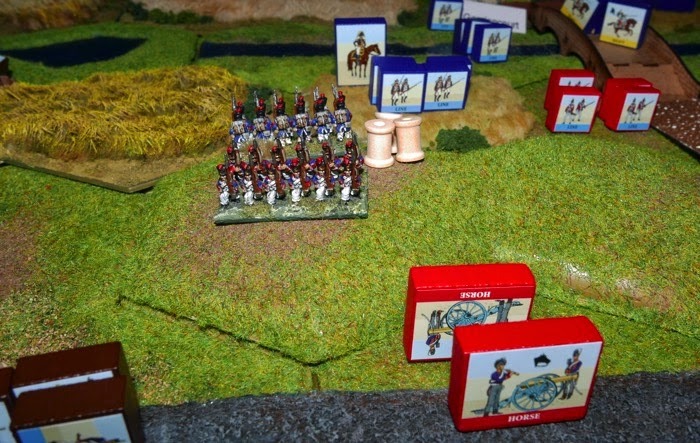 I used GMT's Quatre Bras scenario as the basis of play. The turn structure, cavalry charges, formation rules and game clock remain from that play test, but pretty much everything has since been tweaked and some parts, substantially so. Quite a lot of work had already gone into the rules, but I hit a wall. I knew what I wanted to do, but the relationship between the processes just seemed messy. Even producing a table to help bring everything together just didn't help. It simply wasn't intuitive enough. Anyway, a few days later I combined two attack charts and bingo, the cloak of darkness fell from the system and then in rapid succession a number of other improvements fell out of that. The result being the Beta April 23rd version that would be used in a face to face game with Mike. We played our game which resulted in some mixed reflections. The game had gone alright, but it needed to be bloodier and a bit more dynamic. It felt a bit dry and some of the processes were still a bit disjointed - and so on to the next version - the version presented here. I ditched the average dice (a hangover from the first version) and went to D6 for combat but stayed with D10 for command. The game generated more heavy casualty markers and to dampen that effect down a bit, units would test for removal from play after taking four such hits rather than the previous 3. The army disintegration levels were changed from being based upon total units removed to instead being calculated by the number of heavy casualty markers accrued during play. Movement rates were increased from 1 hex per turn to between 2 and 3 hexes depending upon terrain. Plus there were a load of other refinements that came out of several re-writes. Units are rated 'mixed ability', 'reliable' and 'good'. These could typically reflect militia, veteran line and guard respectively. To do some things, a unit will need to take a Command and Control test. This is done by rolling a D10 against the units rating (described above). As a unit takes heavy casualty markers and is disordered it becomes harder to pass these tests, which encourages the keeping of fresh reserves. Combat uses a D6. Hits are always inflicted on a 6, and also on a 5 if the target is not in cover. A roll of 1 will always hit the attacker. The first hit is simply a disorder / retreat type result, subsequent hits (in the same attack) generate the heavy casualty markers. Multiple dice can be rolled in a single attack. The sequence of play is contained within the structure of a turn, but the number of turns is somewhat irrelevant as the game is governed by a game clock (like the Tigers at Minsk rules) that is managed using a normal pack of playing cards. Quatre Bras for example will start at 2 pm. At the end of each turn, four playing cards are drawn and their combined values will determine how many minutes the clock will advance. Royal cards and aces are worth 15 minutes each, everything else is worth the value of the card. This clock will be used to determine when reinforcement will arrive and some combat results say things like 'the unit retreats 2 hexes and then it cannot do anything until at least 1 hour has elapsed while it re-organises'. cards shown would advance the game clock by 45 minutes. Because the turns can represent anything up to an hour, unit facing is not used, though flank attacks can still be made when attacks are made against the same hex and those attacks are separated by at least 1 hex side. Formations of line, attack column and square are used and each of those can be either ordered or disordered. Cavalry do not move around the battlefield at top speed each and every turn, rather, they move the same rate as everything else, but their charge is powerful and more to the point, (as it is with assault columns) it combines movement with attack in the same turn. As they charge their target, there is a defender reaction which is different depending upon whether the target is infantry, artillery, light cavalry or other cavalry. I like the horse artillery effects, which are managed simply via the sequence of play. Phase B allows horse artillery to move, Phase C allows all artillery to fire including any horse artillery that just moved and Phase D allows any horse artillery that fired in phase C, but didn't move in Phase B to now move. This gives horse artillery the flexibility of move / shoot or shoot / move, throwing them into action at points of crisis. 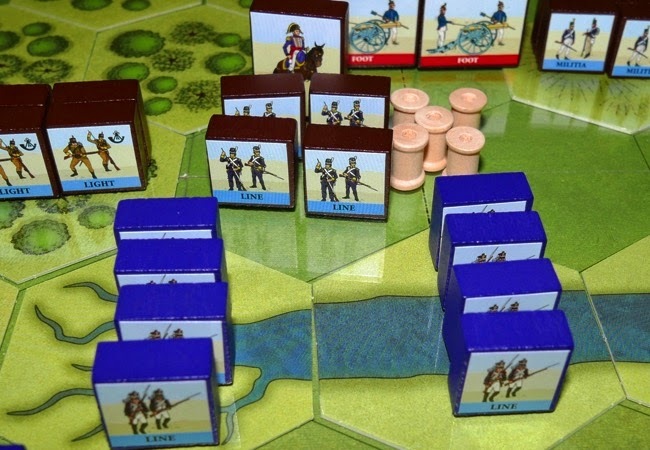 Phase A - (re-order) units can change formation, cavalry can lose blown markers and disordered troops can become ordered, but they must pass a Command test. Phase B - Horse artillery can move. Phase C - All artrillery fires including any just moved horse artillery. Phase D - Horse artillery that did not move in B but did fire in C may now move. Phase E - Cavalry charge and units react. Phase F - Infantry in attack column that are not adjacent to an enemy can move AND if they do, they must attack. Phase G - Units that have not done anything in Phases B - F can now move. 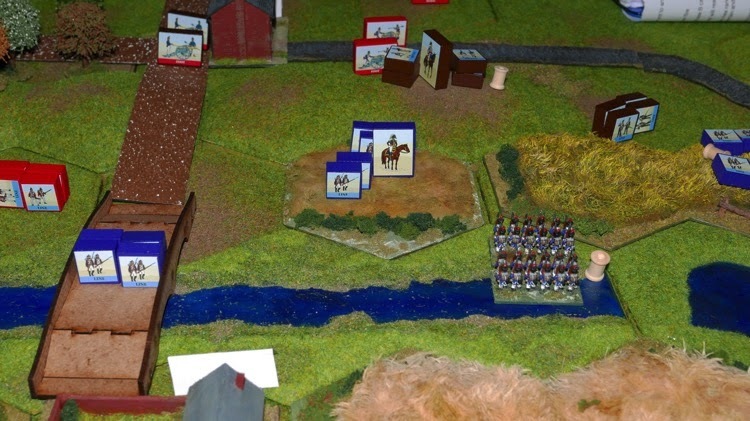 Phase H - Infantry and cavalry that have not done anything in Phases B - G can now attack. Squares cannot attack and units in attack column now firing (not used in F) lose 1 attack dice. Phase I - Army disintegration, armies that have reached 25 heavy casualty markers take a Command test for every unit on the table and those that fail fall back two hexes. Admin Phase - The players draw four playing cards and advance the game clock accordingly. Player one begins the next turn. Anyway, there is a link at the foot of this post that gives the reader download access to the current beta version of the rules. Hopefully there is something there for you to like. Remember - this is just for fun. 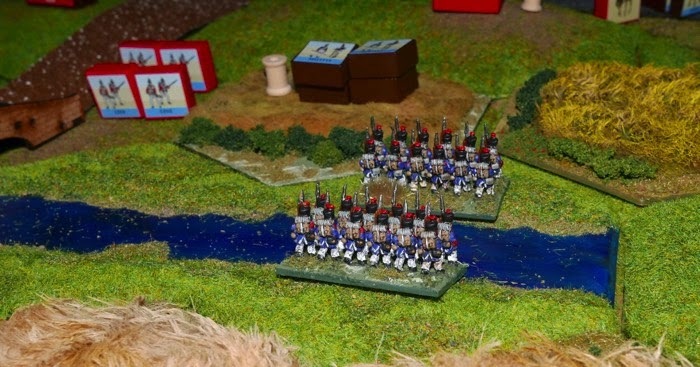 I have also been working on a Quatre Bras scenario written specifically for these rules and this can also be downloaded using the link at the foot of this page. This post will now give way to an AAR giving an overview of the latest play test with the Beta 30th April rules. 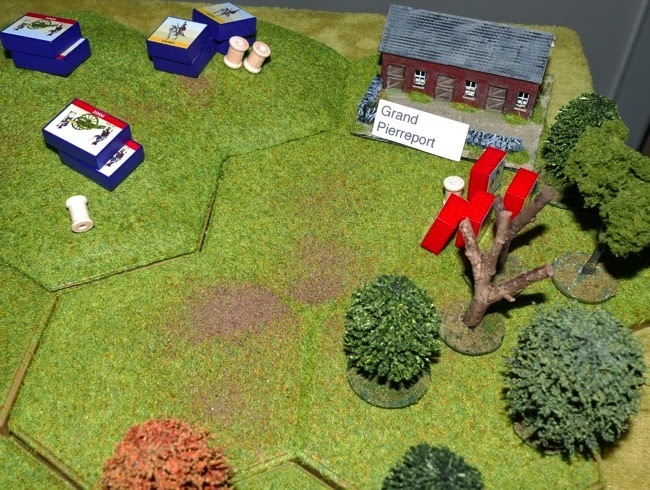 I am setting up using Kallistra terrain and the unit blocks from my Commands and Colours base game to have a first go at my Quatre Bras scenario. We will be doing a face to face, so hopefully Mike will like the changes since we last played. Setting up - The game begins at 2 pm. The Anglo-Allies have a fixed set-up with exception that they have a single detachment that they can place anywhere adjacent to the stream or pond. The French player is Player 1. Their forces start off the table, so they will most likely introduce them in Phase G (general movement phase), though reinforcements can charge onto the table with cavalry in Phase E, or arrive in attack column formation in Phase F to assault a unit. Quatre Bras map, viewed from the French perspective. Scenario rules - There are a number of special rules to deal with some unique aspects of the battle. The table (reverse view of above map - this is the Anglo-Allied side of the table). The photography does not really show the hills well. Winning - the major goal is the same for both sides, hold Quatre Bras and collapse (25 casualty points) the enemy army while avoiding that fate themselves. If neither player achieves this by 9 pm when the game normally ends, then a draw is declared. 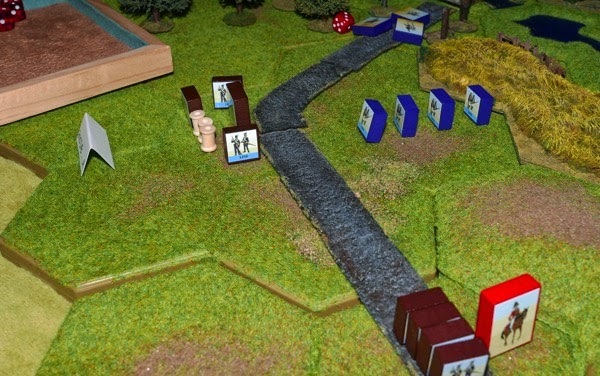 Players can determine whether a minor victory exists based upon heavy casualty markers accrued and or terrain objectives held. A player will also win if they push the enemy beyond collapse and on to breaking point (32 heavy casualty markers) during play. The French get themselves onto the table. Turn 2. the time is 2.41 pm. At set-up, Gemioncourt is defended by a detachment (special rule), represented by a single block. They only get 1 attack die and can only take one heavy casualty marker. But here, that is good enough to repulse the initial French assault, with the attackers becoming disordered - represented by their blocks being spaced apart. (above) Another French column strikes. The target is 1st Brigade (2nd Dutch/Belgian Division) located in the rye field adjacent to Gemioncourt. The attackers score 2 hits, forcing the defenders to take a Command & Control test, which they fail. The ultimate result is that they take a heavy casualty marker, are forced to retreat 2 hexes and are also marked that they cannot advance (or conduct ranged fire - not applicable to them) for one hour. A note showing 3.41 pm is placed next to them as a reminder as to when this restriction will end. Turn 3. Time 3.10 pm. The 3 pm Anglo-Allied reinforcements arrive behind Quatre Bras, which include Wellington and British 5th Infantry Division. This is a welcome sight for the Anglo-Allied player. Wellington takes over the role of army commander. Turn 4. Time 3.34 pm. The French have started rolling badly - there is nothing for it other than to replace a unit of blocks with my only two bases of painted French infantry (I have a French and an Austrian 10mm army in the painting queue) - these fine fellows are bound to change French fortunes! The rest of British 5th Division arrives. Turn 5 - Time 4.11 pm. Gemioncourt falls but already the way ahead is well defended. The French wait for some support to follow up. (above) French lancers have previously attacked an enemy infantry brigade, forcing it into square and inflicting a heavy casualty. The cavalry falls back, disordered and blown (just visible at the top of the picture), while disordered French foot in attack column assault the Dutch / Belgian square. Their attack is particularly effective and they inflict another two heavy casualty markers. 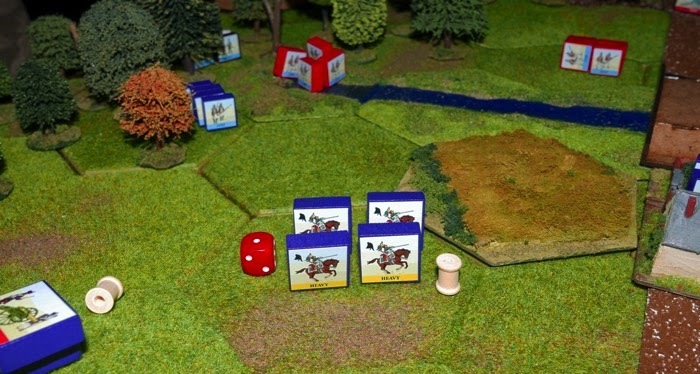 When the unit now takes a command test, the die roll is modified by +3 for the casualty markers and +1 for being disordered, making it much harder to pass a test - players are rewarded for keeping a reserve of fresh units ..... such as the fresh column (above) that is marching up the road to support their troubled comrades. This unit gets a bloody nose after assaulting the high ground beyond the stream. This French line unit has been pushed back and is not allowed to advance for an hour (until 5.11 pm). Turn 6 - Time 4.38 pm. Merlen's 3rd light cavalry Brigade (Netherland Cavalry) was the first Anglo-Allied cavalry on the field. Historically, they were a reliable unit, but they had been riding to the battlefield for 9 hours and their horses had been saddled for 20 and were exhausted. As soon as they arrived they were put straight into action - and were put to flight. There is a special rule in the scenario that deals with this. On arrival, they are considered 'reliable', but the first time they take a command test, they test their rating. In the game, the die roll did not favour them, they dropped from 'reliable' to 'mixed ability'. Then on their charge, they rolled two 1's, which inflict self hits. The outcome was the cavalry retreated 2 hexes, took a heavy casualty marker and would not be allowed to advance for an hour - which sort of nicely reflected the history. Unlucky timing for the Anglo-Allies, the clock falls just a few minutes short of them being able to receive their 5 pm reinforcements. (above) The artillery is in hex B9, near the woods, by the second bridge (photo viewed from the Anglo-Allied position). French light infantry (1st Brigade - 5th Division) have penetrated the wood and are poised to attack the artillery, but before they do, French lancers charge the artillery and the guns are abandoned by their gunners (guns removed from play). The lancers are left disordered and their horses blown. Bottom left are Merlen's Hussars, which are also disordered following their rough handling in the previous turn. Prince of Orange is to the right, attempting to re-order the disordered infantry. It will be noted above (in the turn detail) that the Anglo-Allies are taking substantially more heavy casualties than the French. Though reinforcements are now arriving, it is possible that too much harm has already been done to their army to give them the time they need to develop attacks. Off picture (to the right) Anglo-Allied horse artillery gets up on the hill, adjacent to French line and fires at close range, but the attackers roll three 1's (disaster) and suffer two heavy casualties. This combines with the 2 heavy casualties they have already. Once a unit reaches 4 heavy casualties it must take a command test and if they fail, they are removed from play (treated as broken and routed) - unfortunately for Wellington, that is exactly what happens. It is not however all entirely going the French way. On their left, the Anglo-Allies have retained control of Bossu wood and are starting to build up their numbers there. French 2nd Heavy Cavalry Brigade (11th Cavalry Division) charge, but the British (in front of the woods) handily make it into square and the cavalry are repulsed with a heavy casualty (and blown) marker. Above - French artillery will move up and occuply the field to the right of the heavy cavalry. The French Centre - is this where victory will be claimed? (above) The French centre. They want to clear the high ground to deny the enemy a vantage point for their artillery. The British guards arrive at 6 pm. The French are unnerved at so much red uniform on the other side of the table. shown from the Anglo-Allied side of the table). The French need to crack the Anglo-Allied will to fight quickly before their own left flank collapses. snipping fire from the Brunswickers Light Infantry Brigade. 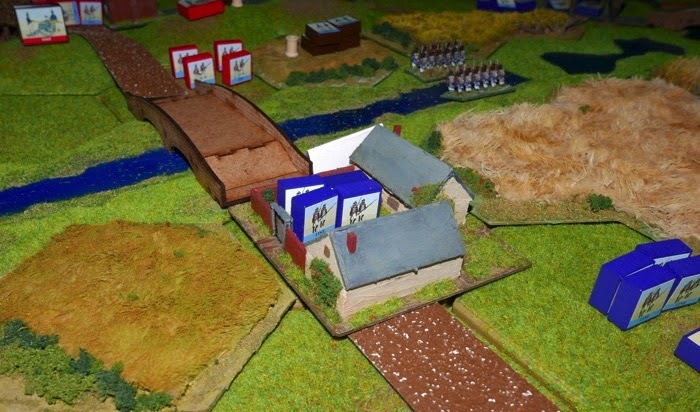 The Brunswick Light Brigade have pushed right down Bossu wood and captured Grand Pierreport. They continue their sniping at 1st Brigade's light cavalry (2nd cavalry Div), forcing them to retire off the hill. The French left is checked! Looking at Bossu wood from the French position. The red uniform is starting to come through the woods. Dutch / Belgian troops are on the left in the tree-line. Turn 10. Time 7.10 pm. French heavy casualties = 11. Anglo-Allied heavy casualties = 22. French infantry line brigade in square, holding onto high ground. French line have managed to get onto the high ground South East of Quatre Bras and despite cavalry forcing them into square, they have withstood repeated attack - even by horse artillery brought up to the base of the hill. Turn 11. Time 7.57 pm. French heavy casualties = 11. Anglo-Allied heavy casualties = 24. The end is getting close! In the centre, a French column inflicts the 25th heavy casualty marker and the Anglo-Allies must now adopt Phase I into their sequence of play as they have reached the army collapse level. As a special scenario rule, the collapse also released the French Imperial Guard Cavalry to Ney (2 brigades of light cavalry and 1 battery of horse artillery). EDIT - I have changed this so that the cavalry are released when one side reaches 20 heavy casualty markers, as that suggests collapse is imminent and it gives them some time to get into place on the table to make use of that collapse (or ensure it happens!). In their Phase I, the Anglo-Allies generally roll badly for each unit on the table. There are a number of retreats off the table and some units blocking the path of others etc and the culmination of effects creates enough new heavy casualty markers that the Anglo-Allied army reaches the 32 casualty break figure - at which point they simply lose the game. This all happened in the last moments of turn 11, so I turned over four more playing cards just to see how far the clock would advance if another turn were played, resulting in the time advancing to 8.49 pm, so just just 11 minutes short of the end of game time, so I was quite pleased with that in relation to the progress of the battle compared to victory and collapse and clock time. 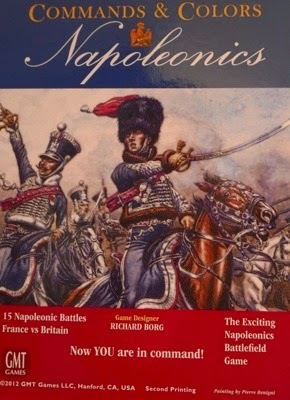 Conclusions: Well, I enjoyed that very much, it did fit my notion of napoleonic warfare .... but I am mindful that self praise is no recommendation and that I am not even a napoleonic buff - indeed it may all be a bit too rock, scissors, paper for some, as I may have fallen for some stereo-typing. While Quatre Bras makes for a nice compact battlefield, it also seems to provide a lot of cover (looks like it would make a good ACW battlefield) and so those hits on 5's and 6's may just prove too much on a more open field - only time will tell. The cover makes the game less lethal, which in turn extends play. A 12 x 9 grid (on a 4' x 3' table) does seem to give enough room for the game to breathe and for there to be a sense of very different things happening at various locations at the same time, with small narratives cropping up here and there, such as my French units in square on the enemy hill, that stoutly defended against the odds and an artillery piece that twice repelled light cavalry charging in the opening turns and the failed attacks upon Gemioncourt, reflecting how these little strongholds could impede the advance of a whole sector. Interestingly, we both felt that when we did the second play test using just GMT game parts (including the scenario) that it became a little difficult to mentally unlink C and C with what we were trying to do - sort of "if it looks like C and C, then that's what it should be and anything else just feels plain wrong". Once we moved to the 3D terrain - even with the blocks, we felt that wasn't the case so much. Likewise, just adding a couple of stands of 10mm figures on the table, just seemed to give the game its own feel and it should look nice when a couple of armies are painted up. 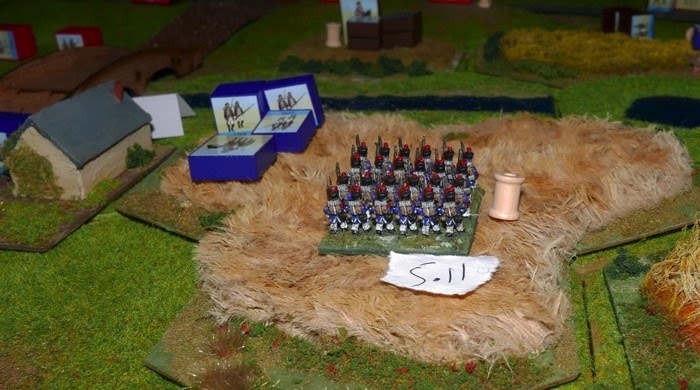 The game clock seemed to work alright, especially for a meeting engagement in which reinforcements are being fed into the battle against a set time-table. Compared to the last game, over roughly the same number of turns, there was a 50 minute difference, so perhaps just enough to do things like delay or advance reinforcements by a turns worth etc. In our game it mattered a couple of times - no doubt Wellington would liked to have seen his guards a turn earlier. Anyway, I hope that this post encourages you to download the rules and have a look through, you may even see something to take away for your own games. I have made the most recent beta versions of both rules and scenario available via links at the foot of this page. LINK - Beta April 30th version of the rules. 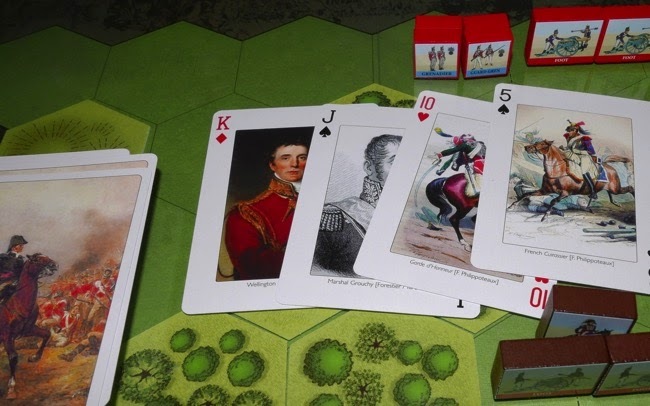 LINK - Beta April 30th version of the Quatre Bras scenario. Note - within a couple of hours of publishing, I noticed that the modifier for coming out of square on the command table was wrong, it should be MINUS 2, not +2. It was the last thing I changed before sending the file to the dropbox - I was careless for not checking, it will just need the last page printing. I have renamed the version as Beta 3/5. I went through your rules, and I picked up a small useful idea - apparantly you do not use orientation of units (correct? ), but just say fire can only be dsitributed in a 120 degree arc; and flanking attacks are defined by being attacked from 2 non-adjacent hexes. Clever idea, which I will use in my own rules as well. Hi Phil, thanks for the blog link. Unit facing is not used and units can fire in ANY direction (not limited by 120 degree). I felt that due to the length of time a turn represents, units could really orientate themselves as required and so there was not a need to show facing. Once I had decided that, then using the 'two (or more) non-adjacent hex sides' rule for flank attacks makes it possible and easy to still get flanks into the game system. It can matter which unit fires first, as it is the second firing unit that gets the flank bonus attack dice. I like to think that the first unit is engaging the defender normally - in effect pinning it place and the second unit is working into the flank. Also the flank bonus dice themselves will not generate harm to the attackers. Interestingly, just by nature, I do find myself physically facing the unit into the direction of attack - but of course it is just a visual thing, the facing is totally irrelevant. I like the look of your table - both the hexed and non hexed mats look nice. I enjoyed this report and like the look of the game esp imaging a horde of 10's. Just downloaded the rules for a read. Like Phil I like the idea of defining a flank attack by the spread of the attack rather than than the facing of the defender.Much simpler than the amount of writing I had to do to try for a similar effect. As for self praise, for a game designed primarily for one's own enjoyment rather than commercial success, I feel it is the most important measure. No point developing a game others approve of if you don't like it. Just starting to read more back posts on both blogs. Thanks Ross, you run a fine and much visited blog, so your comments are appreciated. I think writing for hex rules becomes much easier once one sees units in the minds eye as simply occupying and controlling a space. I would like to try a version of these rules with ACW (since those armies are about to come off the painting table). The Cavalry / square rules would be massively weakened and the ranged fire rules strengthened, which should help the period jump. I hope your travels around the blog bring up some bits of interest. Thanks for signing up and commenting and good luck with your new grid size. cheers Norm. Very good-looking rules, and I am looking forward to trying them out. Very unusually, you do not reduce infantry movement for being in line rather than column. Could you say why you have done this? Thanks Stephen. From the outset, I decided that the battlefield would represent the tactical area of combat and so March Column was not adopted, neither were cavalry allowed a superior movement rate to everything else unless charging into contact. Accepting this, I felt that the formations adopted were more about the prosecution of firepower and attack , rather than about movement and that Command and Control was essentially being maxed out everywhere to achieve that - so being in Attack Column was not about getting from position A to B, it was about attacking with energy and that is what rule and turn sequence is trying to achieve. The point at which a unit changes formation is really an abstract notion, it is reflecting the commanders intent of how to use that force as much as it is the force actual physically changing formation on the board - so the testing of units in Phase A to change formation is about command intent. Using the various stages of the turn sequence to manage these differences, I am hoping that the construction of the sequence of play, better resembles the nature of the battlefield. So Horse artillery get to ride up to the enemy, deploy and fire (or the reverse) and the column is the attack column that it intended by force along a narrower frontage to 'breakthrough'' the enemy IF they are used for that purpose at the appropriate time, otherwise there is the default Phases of G and H, which are a little more traditional. That makes good sense - thanks for the detailed explanation. Is this also why there is no difference between line and column as a target for artillery fire? Partly, yes. because from the outset I wanted the rules to be narrative based. So for artillery, I looked for those significant things that best reflected their 'character' that would help the battle narrative. I felt this to be close fire with cannister, longer range fire and the relationship of combined arms when dealing with an enemy that had been forced into the double edged situation of going into square (Hence the +1 for firing against square), plus the capability to move Horse Artillery up to fire at close range at points of crisis. The rules also only give flank advantage to infantry and cavalry attacks. These things taken together mean that I deliberately avoided the angle of attack for artillery (i.e. the depth of the target) and so not only is there no advantage against column, but neither is there enfilade advantage against line. this write off against increased complexity of rules was based on my feeling that the narrower but deeper target of enfilade fire, the similar case for column, the undulations in the ground that altered visibility on a minute by minute basis with non-static targets and the certaintty of hitting a wide line, but decreased damage on just a few ranks depth, worked together to make out-comes less distinctly different overall than we sometimes want to show in micro-managed games. Also note that the compact square only offers a +1 bonus and I felt that the other target types were less vulnerable than square, so in consequence less than a +1 advantage - which obviously I could not show. Overall, the artillery seem to play a balanced role within the game, though I think a player if they wanted to could simply always offer a +1 if they thought the artillery had an advantage - though to my mind, that would diminish the 'story' of the artillery, cavalry, square relationship - which may of course be over-stated in our view of how these battles were conducted anyway. Thanks again. I think the thing that has been puzzling me is trying to work out why, if your army is permitted to use Attack Columns, it would ever use anything else. There seems to be no disadvantage. Historically I believe that columns were vulnerable to artillery fire at long ranges, though no more so to canister (which didn't have the same penetrating power) than lines. The advantage is they can be used in a planned attack to move AND attack in Phase F and get 3 attack dice - that is pretty powerful, but if they then remain adjacent (i.e. have not seen the enemy off), they can no longer use column attack in Phase F, but rather go down to 2 attack dice in Phase H in the next turn ..... while any line they are up against will be using 3 fire dice in Phase H against them. So column are good on the initial attack (punchy), but if they get snarled up with line they start to fight at a disadvantage and the 1 D6 difference does matter. They are also further disadvantaged by having to pass a test in Phase A if they want to switch out of column back into line - which they might fail and then be stuck in column for a further turn. This is all meant to show that Fresh troops are useful (so a reserve is encouraged), but that once committed, flexibility and strong command and control is loosened, leaving the poor old player deliciously frustrated. Better quality troops will perform better in this regard. I would agree that column would suffer to long range artillery, but in my mind, Square (sitting duck) is the most vulnerable, followed by column, followed by line - many games represent all those 3 givens, but I have given the bonus against the square only (+1). For this to change, there are two choices, you can either also give a +1 against column or +1 against column and shift the bonus against square to +2, but I think that is a too greater benefit against square. If you give column a bonus, then artillery has an alternatively attractive target to go for other than square, which then weakens the way cavalry and squares inter-act following charge. It's all something of a balancing act and the rules are honest enough in their opening to state that 'the design is intended to give a good game rather than simulation'. Napoleonics are a secondary period for me and the rules are a Beta version, so changes are possible. So does that mean that in order to make a column attack, the infantry must move at least 1 hex (as with a cavalry charge)? I must have missed that. It would certainly make a difference to the dynamics of a column attack. I take your point about the difficulty of deciding the benefits to artillery of firing at different types of formation. +2 against a square is probably too much of an advantage. Please don't think that I am criticising the rules, which I find refreshingly different from most Napoleonic systems. And if it has to come to a choice, I would much rather have a good game than a dull simulation. I am in the process of building up a Napoleonic force myself, and your rules are a good incentive to keep painting. If you ever test an ACW version, I would very much like to know how it goes. 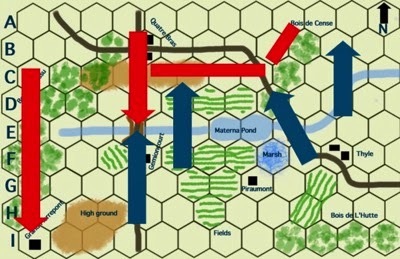 Hi Stephen, yes, Column Attack is a combination of move and attack, which is quite an advantage and it marks a moment in time when the unit has the momentum and energy to drive an attack home - but there is an abstraction also going on post combat that is reflecting that the unit may be spent or may need to shake out into line etc. I think the rule section could do with a sentence that makes that clearer, as on re-reading it it looks implied rather than clearly laid out. It's OK, I didn't take your comments as undue criticism, but rather, I am pleased that you are here discussing the rules and putting them to test. I am not particularly precious about my rule writing. I see them as things that I do for myself, but am happy to share..... especially against a back ground of hex rules being a bit niche. Interestingly, I have ACW armies and since I have yet to paint up my French / Austrian napoleonic forces, I have started to write a derivative set of ACW rules based on the Eagles at QB set. Rules often cover both periods with a short set of amendments for one or other period, but the tactics and weapons are quite different and the 'engineered' sequence of play seems a good place to reflect that while other principles of the system can remain intact. I will post once I have something that is starting to hang together. I look forward to seeing how your ACW set goes. 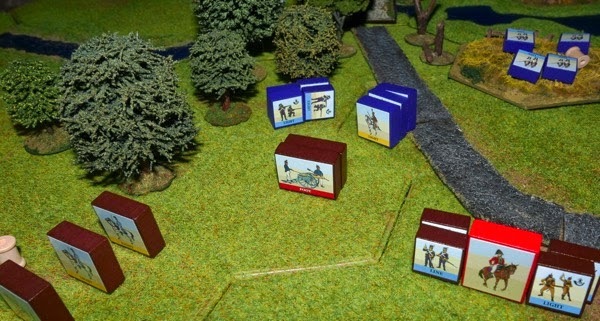 If you are looking for some quick-to-produce armies to develop the Eagles rules, you might want to check out the 3mm and 10mm paper miniatures contained in the Waterloo Wargame from Paper Battles (http://paperbattles.com. With a little adaptation they could be ideal for Quatre Bras.